Dr. Rokhshana Reaz is working as consultant LASIK surgeon at OSB Laser Vision Center, Mirpur, Dhaka. She has specialized in LASIK and First LASIK surgeon in Bangladesh. Dr. Rokhshana Reaz received her MBBS degree from Sher-E-Bangla Medical College under Dhaka University in 1986. 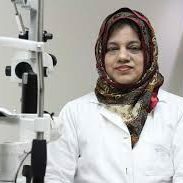 She completed post-graduation (Diploma in Opthalmologey) from BIRDEM Hospital in 2000, after that she obtained superspecialty in LASIK surgeon by taking training from Al Amin Medical Instrument Company under super vision of Dr. Osama Amin and Dr. Mahmud Ismail from Egypt. She is the Pioneer in Lasik Surgery in Bangladesh. She has more than a decade of experience in LASIK surgery field. আপনি কি চশমা ছাড়তে চান? Copyright © OSB Laser Vision Center Ltd.